REGISTRATIONS in InSIS ARE OPEN! Michael Sonntag is a professor at the Johannes Kepler University Linz, Austria. Aim of the course is to give an introduction to current problems of the two areas of security and privacy, and how they interact and can be solved through technological means, e.g. incident response techniques. The technological, legal, and society limitations of these approaches are discussed as well. Students will be introduced to the foundations of these topics through lectures. Based on these, current research and developments are presented and explained. Some aspects of each topic will be covered through practical work or demonstrations as well. 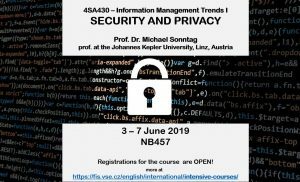 The course encompasses for example introductions to security (threats to ICT, cryptography, risk analysis), the EU privacy framework based on the new EU privacy regulation (including important decisions of the EuGH according to the previous directive) and computer forensics (basics and file system investigation). This course is open (as elective course for 4 ECTS) for Master´s students of Czech taught programs Information Management, Information Systems and Technologies and English taught program Information Systems Management. In this course you will gain hands-on experience in quantitative methods applied in the Financial Risk Management. You will explore different areas of the risk management using statistical and analytical tools used by the industry and solve problems taken from real-world situations. You will learn how to simulate evolution of market factors, how banks predict default rate using social networks, how to predict behavioral patterns of the customers and use that information to manage interest rate and liquidity risk or how to include machine learning method into various areas of risk management and much more. 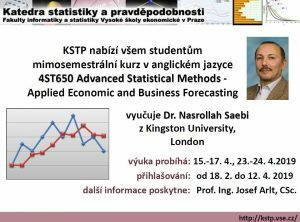 This course is open (as elective course for 3 ECTS) for Master´s and Bachelor´s students of Czech taught programs Mathematical Methods in Economics, Socio-Economic Demography, Statistical Methods in Economics, Statistics and Econometrics, Econometrics and Operation Research, Economic Demography and Statistics. REGISTRATIONS in InSIS ARE OPEN till 12 April! Dr. Nasrollah Saebi is a professor at the Kingston University, London. Measures of forecasting errors and their applications. Forecasting methods for seasonal data: Additive and Multiplicative Decomposition Methods involving centred moving averages and statistical regression technique. Forecasting method for data without a trend: Single Exponential Smoothing. Forecasting methods incorporating trend: Brown’s Method, Holt’s Method. Box-Jenkins Forecasting Methodology and Modelling Procedures: AR, MA and ARIMA models; stationarity and invertibility; Ljung-Box diagnostic model testing; back-shift operator; Akaike and Schwartz Bayesian model selection criteria. Use of appropriate industry standard software packages (e.g. SAS for Box-Jenkinsmodelling and forecasting methods and MS-Excel and Solver for other methods). The theoretical aspects will be delivered through a series of lectures, developing from the basic moving average methods. The lectures will be complemented by practical sessions in which economic and business time series data will be analysed. Here, tentative models are identified and forecasts are made using an appropriate statistical software package. Assessment consists of group modelling assignments. The group assignments are designed to assess understanding of students in selecting appropriate forecasting techniques and models for their time series data, evaluating the validity of their models by interpreting the results from their computer output, conducting relevant tests and performing diagnostic checking and making useful and informative forecasts.